Naomi Campbell, Liz Hurley to name a few. They are semi-permanent synthetic lashes can last up to two months. 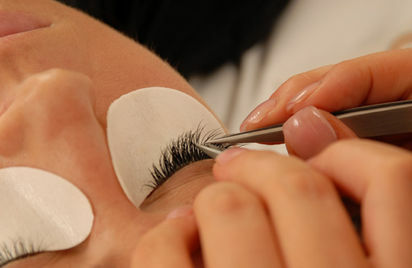 Normally a person's natural eyelash falls out every 2-3 months and a new lash grows in. Because of this occuring it is necessary to get touch-ups to fill in the fallen lashes every four to 6 weeks - the time will vary depending on the individual. The lashes are single strands of synthetic eyelashes that are curved to replicate a natural eyelash. They provide length and thickness to your own lashes. They are applied to individual eyelashes, one lash at a time, for a elegant, natural and luscious look. There is no need for mascara or an eyelash curler. Thicker, longer beautiful eyelashes that are safe in the shower, while swimming, sleeping or exercising. Applied by a trained and certified professional. You just sit back, close your eyes and relax. We do all the work! Normal application time 60-90 minutes. Touchups usually every 2-4 weeks. Call us today and schedule an appointment to have your own beautiful set of Lashes applied.